In recent decades considerable attention has been paid to alternative and renewable energy. Among the alternative sources, the sun’s energy is most appealing. Therefore, the development of solar energy, in the long run, is one of the top priorities. In practice, there are numerous barriers to the growth of the solar energy market. First of all, economic: fairly high prices for solar systems and payback period; the absence of working capital from manufacturing enterprises, the absence of specific mechanisms for stimulating production in the form of subsidies, tax exemptions, preferential tariff policies, etc. Therefore, research into the development of solar energy, as a real tool for a comprehensive solution to economic and environmental problems, is becoming increasingly relevant. The paper considers the energy policy of the use of renewable energy sources in rural areas. The theoretically feasible and technically achievable potential of solar energy in the territory of Ukraine was characterized. It was noted that the sun is the most affordable supplier of energy on earth today. The use of solar radiation is expedient for the development of thermal and electric energy and is possible throughout the territory of Ukraine. 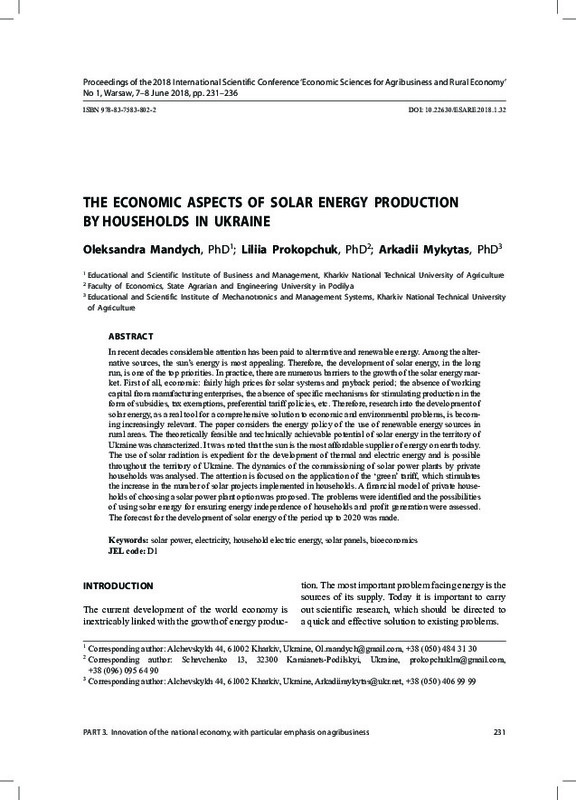 The dynamics of the commissioning of solar power plants by private households was analysed. The attention is focused on the application of the ‘green’ tariff, which stimulates the increase in the number of solar projects implemented in households. A financial model of private households of choosing a solar power plant option was proposed. The problems were identified and the possibilities of using solar energy for ensuring energy independence of households and profit generation were assessed. The forecast for the development of solar energy of the period up to 2020 was made.